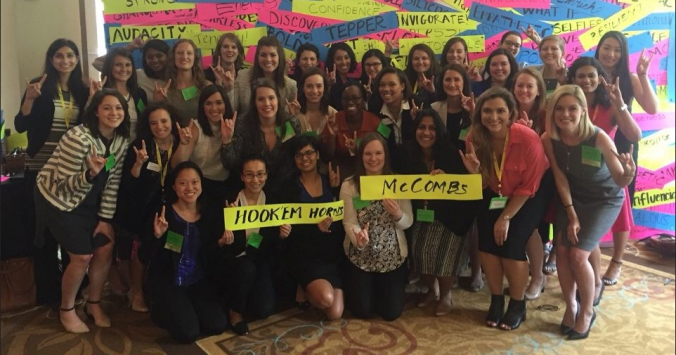 Over 400 businesswomen descended upon Austin, Texas this past weekend for the 2016 Forté MBA Women’s Leadership Conference (WLC)! The event is orchestrated annually by the Forté Foundation, a non-profit organization focused on connecting & empowering women in business, and providing access to business opportunities and education. This year, The University of Texas at Austin had the pleasure of hosting these women in our own backyard at the AT&T Executive Hotel and Conference Center on campus. The WLC reached a new attendance record this June, with 438 MBA students coming from almost 50 universities across the country! The conference is geared toward incoming first year MBA students and rising second year MBA students, and gives women an opportunity to network with a plethora of top companies such as Whirlpool Corporation, Cognizant, Hines, Amazon, AT&T, Dow, Boston Consulting Group, IBM, and Wells Fargo. Our MBA ladies took part in conference prep in the months leading up to the WLC so that they could make the most of the opportunities presented. These prep calls coached first year students on resume writing, networking with the company recruiters, and provided advice on how to follow up with leads generated at the conference. The McCombs School of Business and the Texas MBA Program had the highest number of students in attendance (Hook ‘Em!) with 45 incoming and current MBA students from all our programs. The Class of 2018 newbies had the opportunity to meet one another before orientation in August and our incoming Forté Fellows also had the chance to meet each other at a reception on Thursday evening hosted by Dimensional Fund Advisors. Additionally, thirteen Texas MBA alumni volunteered for panels & networking with current MBA women. Texas MBA ’02 alumna and CMO of RetailMeNot, Marissa Tarleton, spoke on the challenges and opportunities of being a woman marketing executive. CEO of Austin-based startup Shipping Easy and Texas MBA ’94 alumna Katie May was featured on a panel about entrepreneurship. McCombs staff were also featured presenters at sessions such as “Leveraging Social Media for Your Career,” and the Texas MBA Graduate Women in Business organization (GWIB) hosted a fun happy hour on Saturday afternoon. Join Us for Our Next Women’s Event in Austin! Networking with and learning from so many successful and driven women is nothing short of inspirational. If you are making your plans for fall, our 2016 Women’s Forum registration is now open. Future women MBAs are strongly encouraged to attend this exclusive event to network with current students and alumni, meet McCombs faculty and staff, and attend info sessions about curriculum, career planning, experiential learning, and life in Austin, Texas. Apply Now! We look forward to seeing you soon. Hook ‘Em!